Icynene Classic Plus 0.7 pound-per-cubic-foot, open-cell, spray foam insulation provides R4 per inch, allowing a typical 2-by-6 wall assembly to achieve R-22. 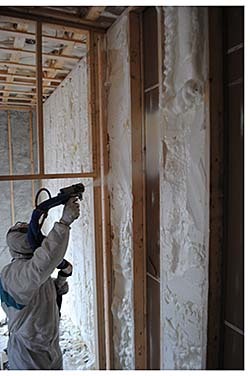 The 100 percent water-blown insulation is vapor permeable, and HFC- and PBDE-free. Yields of 18,000 to 22,000 board feet in a broad range of substrates, temperatures, and humidity conditions.